Holman CF, Atmore, Al. September 24, 2016. Last night at Holman prison an emergency situation developed as ALL of the officers assigned to the second shift waged a historic work strike for the first time in the history of the Alabama Department of Corrections. Assistant Commissioner Grantt Culliver was dispatched to the prison, where he then had to order supervisors from another prison, Atmore CF, to report to Holman prison just to be able to serve meals. The officers at Holman, who have been defying ADOC policy and speaking publicly to the media, had communicated their plans to F.A.M. members, and expressed their support for non-violent and peaceful demonstrations against the human rights conditions existent at Holman. Officers have also complained about overcrowding and the need for a mass release, more education and rehabilitation programs, as well as issues with disease and filth. Officers reserved their harshest criticism towards the Commissioner’s officer and what they perceive as a lack leadership from Commissioner Dunno and Culliver. First hand audio account available here. 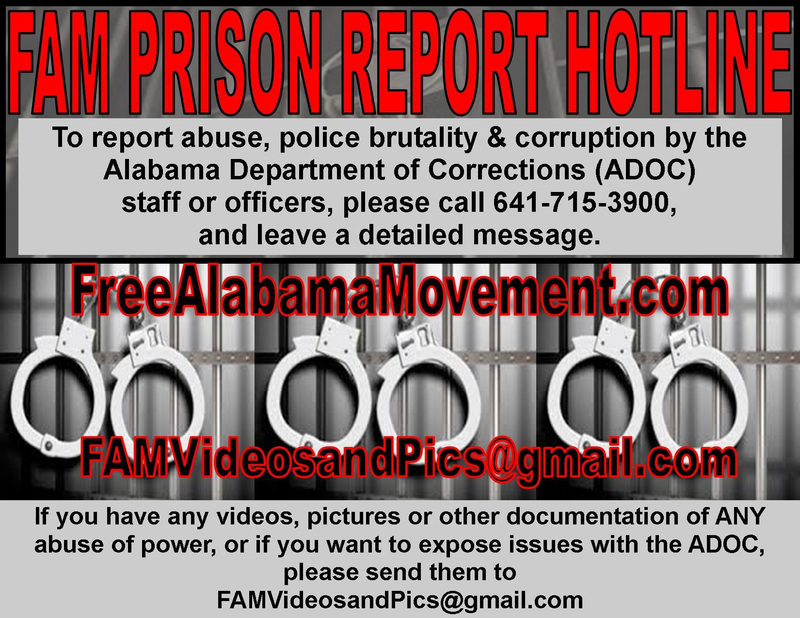 This entry was posted in Free Alabama Movement (FAM), Press Releases, prison conditions and tagged 2016, ADOC, Free Alabama Movement (FAM), guards, Holman prison, inhumane conditions in AL prisons. work strikes. Bookmark the permalink. This officer also went on to explain his thoughts to the recent stabbing of officer Bettis and how from what he heard and witnessed to be hard to believe that it happened the way Alabama Department of Corrections public relations painted the picture. I myself hope more officers realize that it is important they also speak up now. Time will tell. It’s almost as if the writing on the wall is being seen for the first time here in Alabama.However although officers are seeing what’s taking place most have their hands tied behind their backs due to corrections is their paycheck. They want to speak out against the leaders in Montgomery, but are forbidden by their administration with threats of being terminated. Also today it was rumored and leaked that Commissioner Jeffery Dunn has ordered the CERT TEAM to move in on Holman correctional facility. If this happens it’s a sure way to push the inmates in a frenzy that are already under duress. We can only hope Jeffery Dunn uses common sense and conducts himself properly from this moment on. Pingback: Police Brutality, Prison Strikes, and …Theater?